Rubber EPDM sheets are the most reliable and durable material solution for your flat roof. It’s cost effective and is ideal for providing a waterproof roofing solution. The rubber sheet looks natural and has a nice, smooth, clean finish. 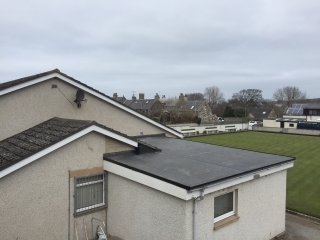 One of the many advantages of using EPDM is that it does not encourage the growth of moss and algae on your roof which means the rubber sheet is very low maintenance. The EPDM rubber roofing is also very lightweight and does not scratch or scuff easily. 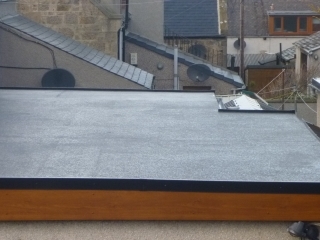 EPDM roofing is black in colour with a choice of black or white edge trims. The sheet comes in 2 different thickness, 1mm or 1.5mm. The product is a long term solution as it has a 40 – 50 life expectancy. If your current flat roof is looking tired and old call John Duncan Roofing today on 01542 833501 for your free quotation or send us an email by filling in the contact form.